A busy metropolis that’s one part bustling city, one part natural wonderland, Bogota has long been regarded as Colombia’s beating heart. But Bogota is evolving — towering skyscrapers sit next to sprawling barrios, hipster shops and restaurants are slowly moving into the city’s grittier neighborhoods and the once-soaring crime rate is dwindling. 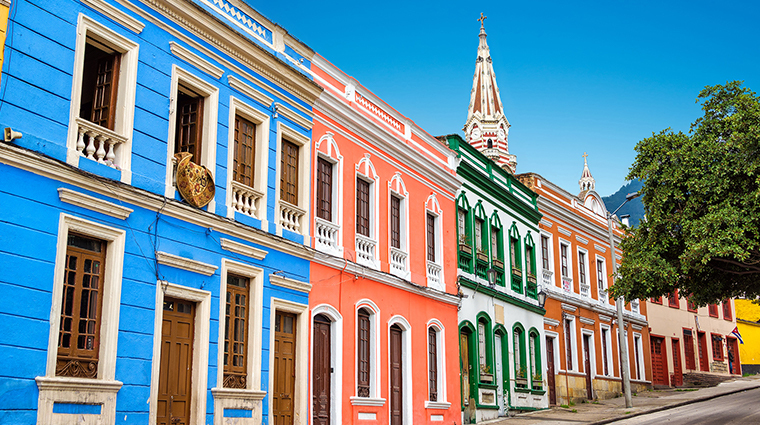 The sophisticated center, La Candelaria, welcomes tourists with its cobblestone alleyways, colonial buildings, 300-year-old houses and a collection of Baroque and neoclassic churches and cathedrals. Natural beauty also surrounds Bogota. The city is flanked by the stunning Andes, and one of the biggest draws is the breathtaking Cerro de Monserrate mountain. The latter sits at nearly 10,500 feet above sea level and is home to a 17th century church that was built in devotion to El Señor Caído (or the fallen lord). With its vast collection of burgeoning shops, high-end hotels, impressive eateries and unique plazas and museums, Bogota is naturally one of the first places to flock to when arriving in the country. Thanks to the mayor’s recent focus on cleaning up the city’s many parks, updating the once-tired public transportation system and resurfacing the roads, the Colombian capital’s popularity will only continue to grow.